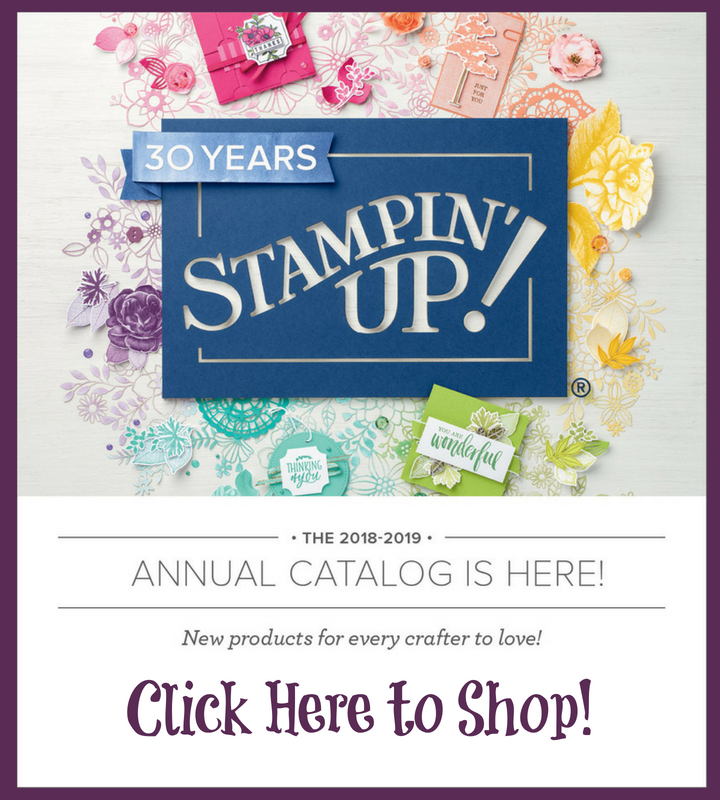 Goodbyes are always hard, so my friends and I at Stampin' Addicts have decided to hostess a blog hop featuring Retiring Stamp Sets! 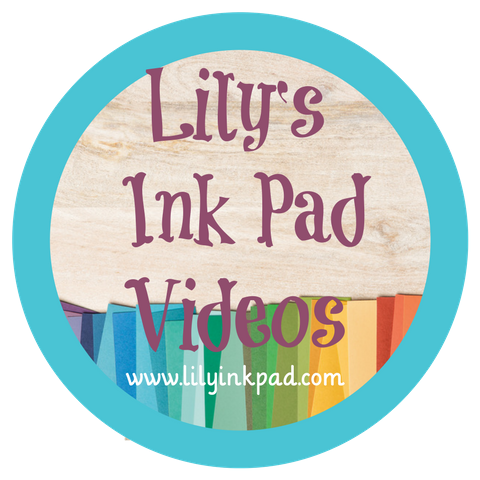 Did you come from Mary's Blog featuring Circle Circus? Maybe you are starting here. Your next stop will be at Heidi's blog featuring Forever Young and you can hop your away back around to my blog again. My set is Elements of Style, a set that I have used many, many times for beautiful cards that seem to put themselves together. With that in mind, I have three cards to share! The chalkboard technique is one of my new favorites and this set is made for it! The front of this card started for a picture frame, but it looked too confined in there, so I brought it out into the open! Beautiful Blues. 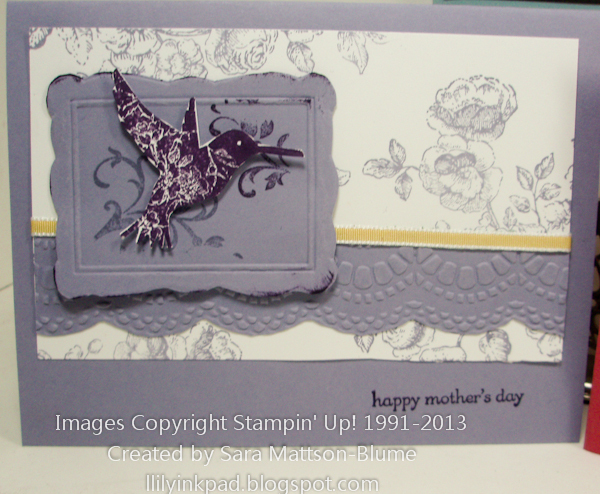 My stamping group loved this one last Tuesday! I'll post recipes on my blog Monday, so come back! Until then, go forward to Heidi's tribute to Forever Young. If you want to go backwards, check out Mary's Circle Circus projects. 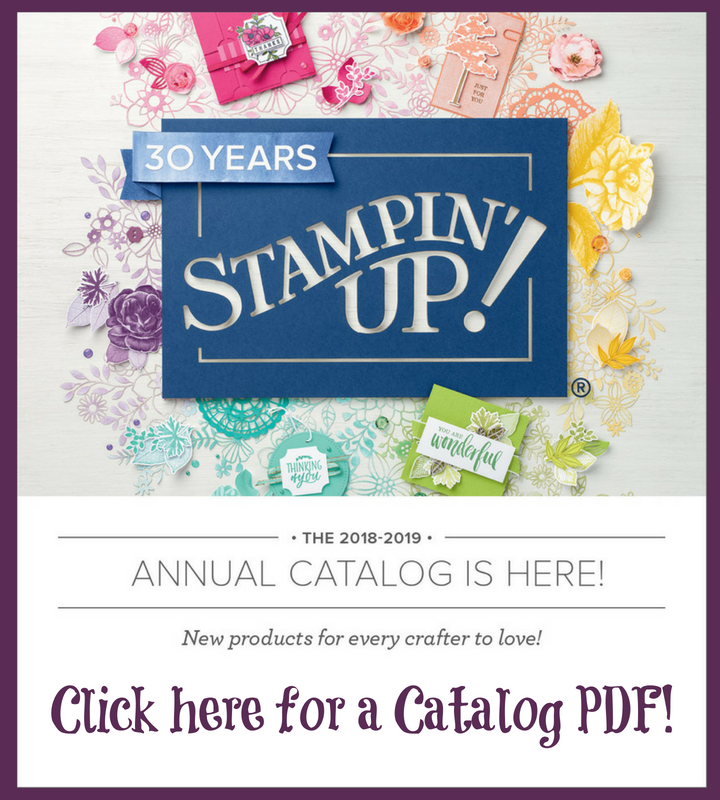 If you get lost along the way, feel free to check out the thread at Stampin' Addicts, a great site for all things stamping. These are great, Sara! The Wisteria and Baja cards are so soft and sweet, and the chalkboard card is striking and gorgeous! I love the chalkboard Technique and the distressing. Great Cards Thanks for Sharing. All of these cards are lovely, but my favorite is the blue one. 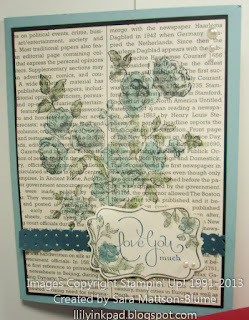 I just love that spray of flowers, and especially the way you stamped and colored it on the First Edition paper! 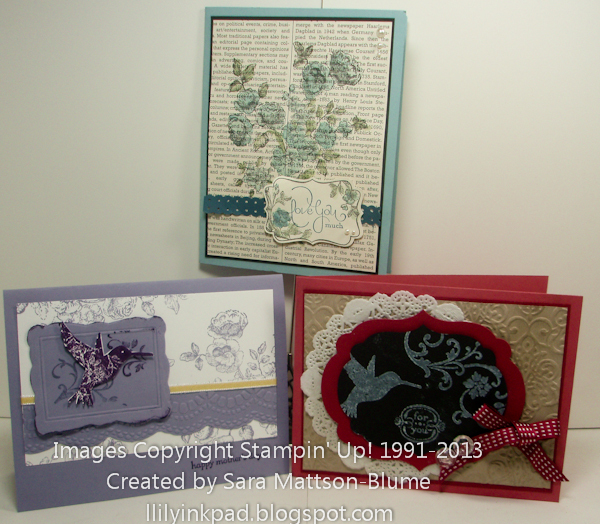 Beautiful cards Sara! 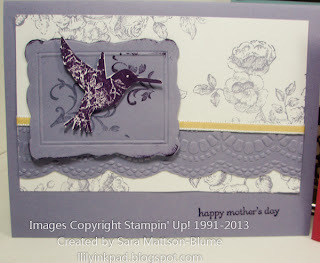 I love the look of the blues on the First Edition DSP (sure will miss it), and the beautiful fussy-cutting of the Eggplant bird on the Wisteria frame. I'm going to miss this set, a lot. These cards are great. I love the chalkboard technique too, but I think the last one is really my favorite....and will I ever miss this DSP! Fabulous cards! I love that last blue one! I may have to CASE it before the month is out! All are gorgeous. Great projects, Sara. Love the last one the most. I see a lot of us wanted to get in a few more projects with that First Edition Paper. Sara you did a great job on all your card. I'm with you I love that stamp set. I've always loved this stamp set on First Edition paper! 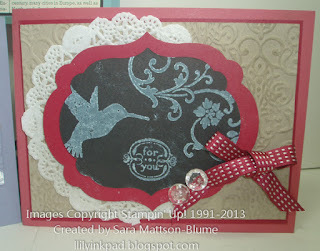 The popped up hummingbird card is really cool! These cards are just lovely! So many special details in each card. Beautiful projects Sara! 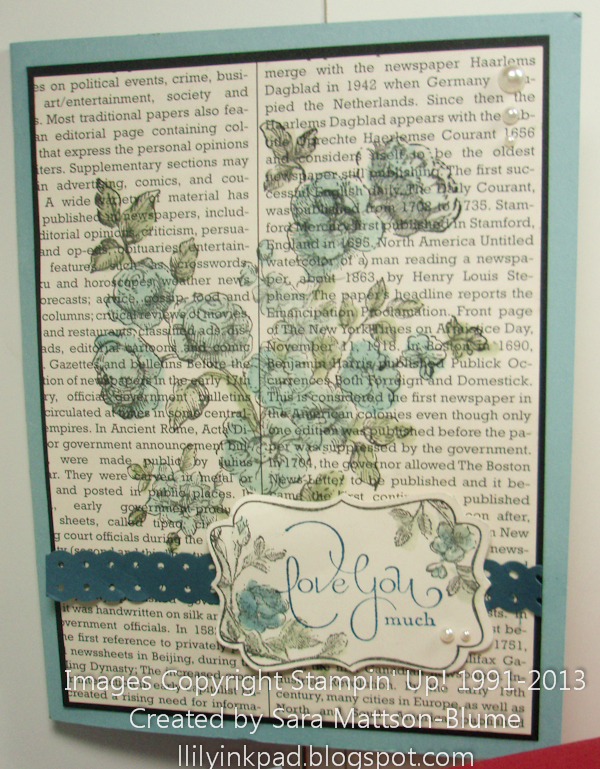 I love the image stamped on newsprint. I'm with your group -- I love the Beautiful Blues card, too. A great use of that stamp!